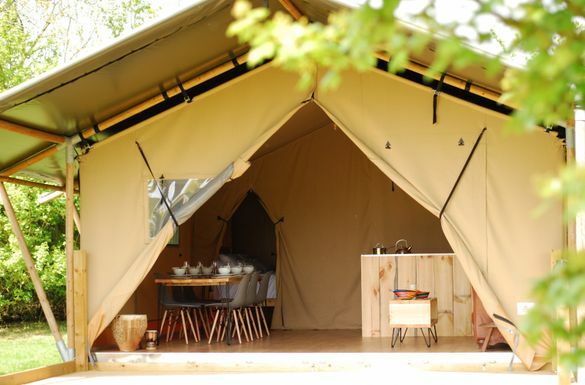 Swap the Serengeti for the Suffolk countryside and enjoy a very literal, ‘Out of Africa,’ experience in a new luxury safari tent in the heart of the county. Owned by a South African native who was inspired by her childhood spent on the family game farm, Twiga, which means ‘giraffe’ in Swahili, sleeps six in three bedrooms, offers glamping fans luxury touches – Egyptian cotton bedsheets, comfortable beds, wood burning stove, kitchen and bathroom and authentic African pieces throughout, whilst allowing guests to enjoy a ‘back-to-basics’ camping experience, where you can enjoy the simple pleasures of total peace and quiet, uninterrupted countryside views and, with no wi-fi, no plug points and patchy mobile reception, a digital detox for the whole family. During the evening, settle back on the covered verandah, fire up the brazier and enjoy a barbecue whilst sipping on sundowners. Guests can also read a book of short stories, written by the owner’s grandmother, about her time spent on the family game farm. Situated on a working Suffolk farm just outside the village of Stonham Aspal, Twiga is ideally situated to explore Suffolk’s prettiest villages, sited as it is along the A1120 ‘Tourist Route’ which links Stowmarket to Aldeburgh via Framlingham, home to Ed Sheeran and castle; Peasenhall; Sibton; Yoxford and more. And, just like South Africa, there’s even vineyards on the doorstep. For guests wanting the animal experience to go with it, Africa Alive!, the county’s largest game park set in 100 acres of parkland in Kessingland is less than an hour’s drive north. How to book: Twiga, sleeps 6 in 3 bedrooms, can be booked through Suffolk Cottage Holidays T. 01394 389189 www.suffolkcottageholidays.com. Prices from £533 for a 3 night short break or from £710 for a week.